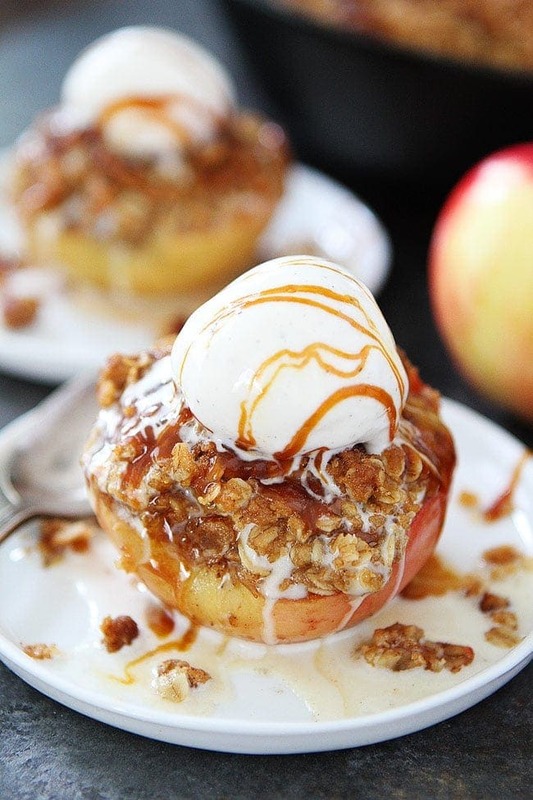 Baked Apples with brown butter cinnamon streusel topping are a favorite fall dessert. Serve warm with vanilla ice cream and a drizzle of salted caramel sauce! 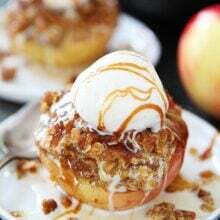 The holidays are here and if you are looking for an easy dessert to serve your friends and family, you are in luck because today I am sharing my favorite Cinnamon Streusel Baked Apples. They are the perfect dessert for fall, Thanksgiving, and Friendsgiving. 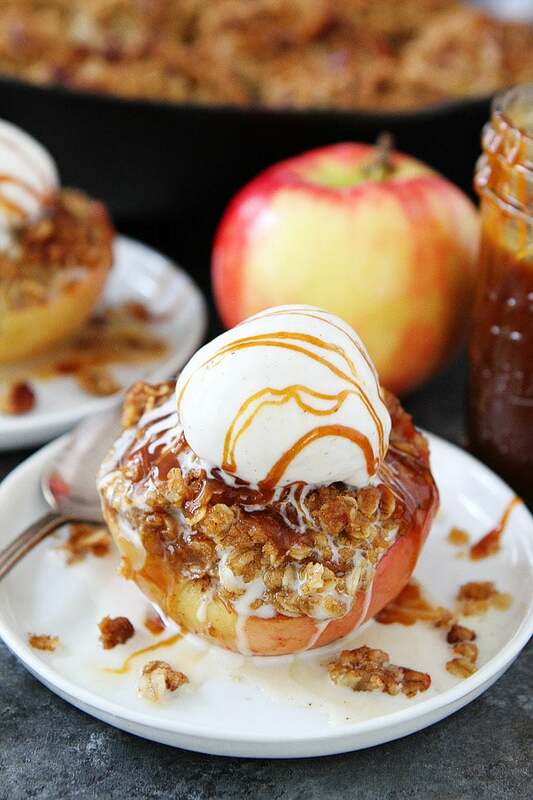 If you like apple crisp, you will love this easy baked apple recipe. The brown butter cinnamon streusel topping is amazing! The brown butter with all of the spices, oats and pecans makes this streusel topping the very best! 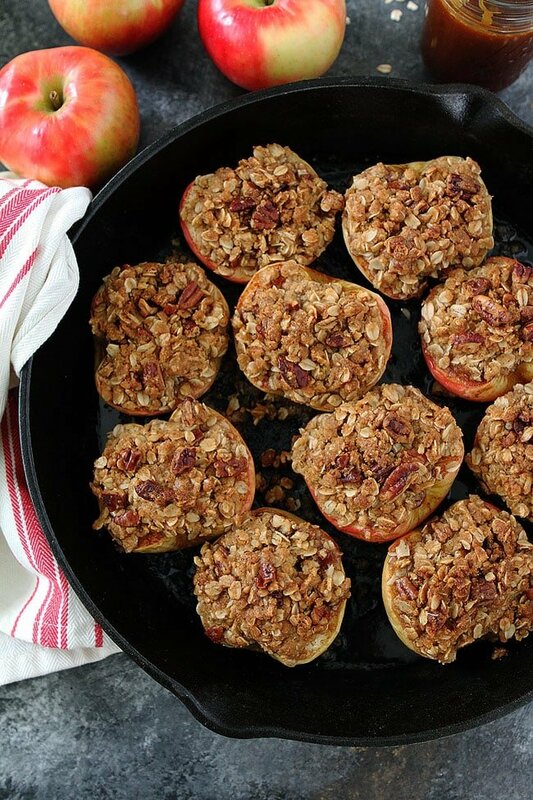 The baked apples are basically individual apple crisps but so much more fun! Mini desserts are always so fun to serve, especially during the holidays. Everyone will love the presentation and of course the taste! 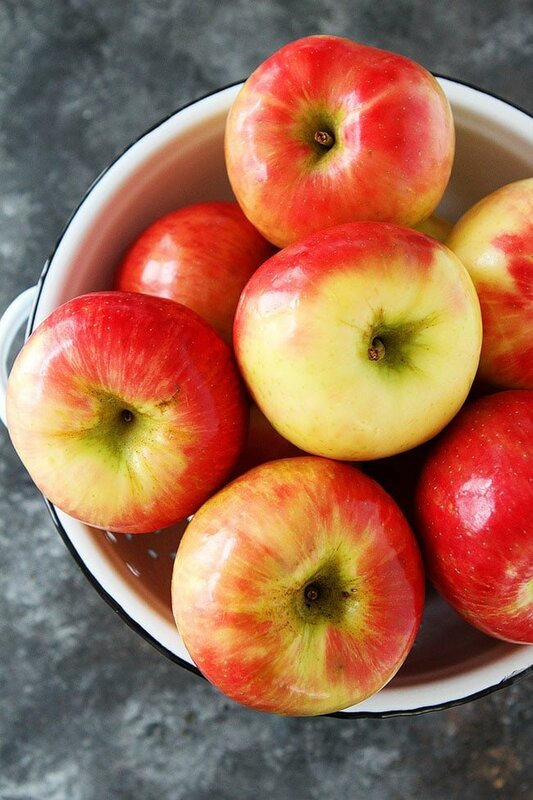 I like to use Honeycrisp apples when they are in season. Fuji apples also work well. To core the apples, I use a melon baller, it makes it super easy. If you don’t have one, a spoon will work. I like to add pecans to the streusel topping for an extra crunch. Walnuts also work well. If you need the recipe to be nut free, you can leave them out. The apples are best served warm with a scoop of vanilla ice cream and a drizzle of salted caramel sauce. Sooooooo good! 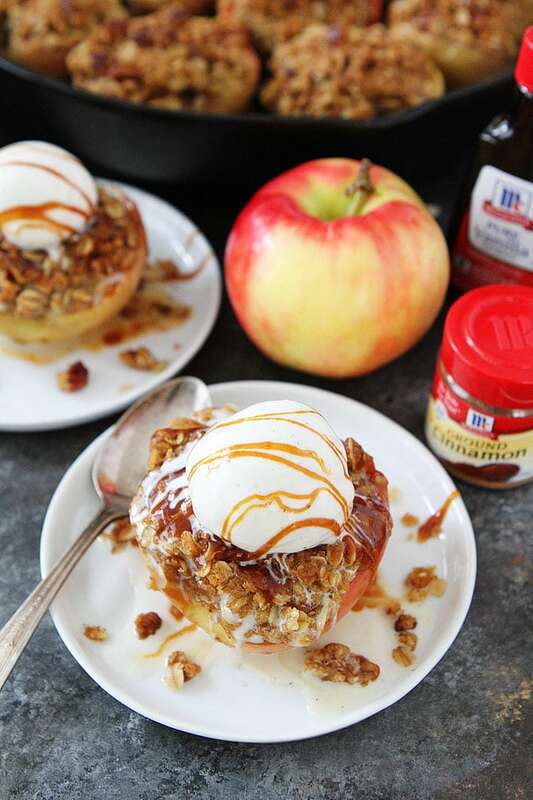 Put Cinnamon Streusel Baked Apples on your Thanksgiving or Friendsgiving menu this year. Your friends and family will love this fun and delicious dessert. It is a holiday favorite at our house! Join in on the fun and share photos of your Friendsgiving or Thansgiving using the hashtag #noflavorlikehome. Need more Thanksgiving ideas, check out these fine recipes from McCormick: Smoked Turkey, Cheesy Potato Casserole and Cranberry Apple Stuffing. Baked apples topped with brown butter cinnamon streusel topping are the perfect dessert for fall and Thanksgiving! Serve warm with vanilla ice cream and salted caramel sauce. Place butter pieces in a medium skillet. Melt the butter over medium heat, swirling it in the pan occasionally. The butter will foam and pop, so be careful. Continue to swirl the pan often. Remove pan from heat once the butter starts to brown and smells nutty. There will be small brown bits on the bottom. The butter should be an amber color. Pour butter into a medium bowl. Add the vanilla extract and brown sugar to the brown butter. Stir until smooth. Add the flour, oats, pecans, cinnamon, nutmeg, and salt. Stir until combined. Set aside. Cut the apples in half from stem to end. Use a melon baller or small spoon to scoop out the apple core and seeds. Dig deep enough so there is a little room to "stuff" the apples with the filling. Remove the apple stems. 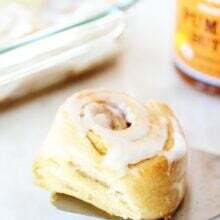 Pour the hot water in a large cast iron skillet or baking dish. Arrange the apples in the baking dish with the flesh facing up. 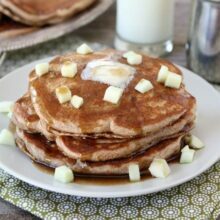 Sprinkle brown sugar and cinnamon evenly over the apples. Divide the streusel topping between the apples, pressing down so it doesn't fall out. Cover the pan with aluminum foil and bake the apples for 20 minutes. Remove from the oven and carefully remove the foil. Bake for 30-40 more minutes or until the apples are soft and the topping is golden brown. You want the apples to be soft, but not mushy. Remove from the oven and serve warm with vanilla ice cream and salted caramel sauce, if desired. I am making these asap- they are gorgeous!! I bet these smell wonderful too! That streusel sounds amazing! These are the perfect Fall treat! i’m thinking… your panzanella salad for dinner + these amazing looking baked apples for desert = absolute autumn perfection. thanks so much for sharing! would you have a suggestion for a substitute for butter in this recipe? The perfect meal! The brown butter is so good in this recipe, but if you don’t want to use it, melted coconut oil is a good option. That might just be the most BEAUTIFUL baked apple I ever did see! Do you think this recipe would work in a slow cooker? I am not sure. I haven’t tried it! Let me know if you do! This looks delish !!!! I wish the serving size could be altered. I don’t have the eye to just wing it. can you make this recipe ahead and store it in fridge or freezer, then gently reheat in oven at the time of serving?